Background: Advanced non-small-cell lung cancer (NSCLC) is a huge challenge for physicians. Traditional chemoradiotherapy is associated with high rates of toxicities, especially when treating gerontal patients. Our study was focused on investigating the safety and efficacy of permanent iodine-125 seed implantation and chemotherapy for the treatment of advanced NSCLC in the elderly. 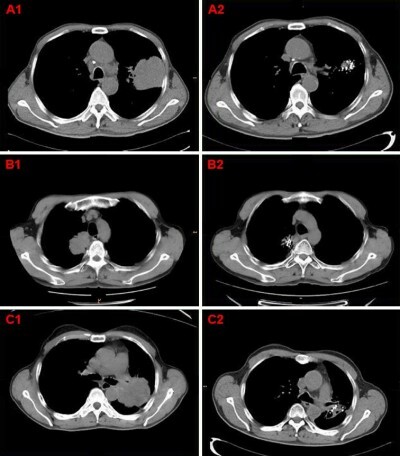 Methods: Fifty elderly patients with stage III or IV NSCLC at our hospital from January 2011 to June 2017 were treated with the chemotherapy regimens (paclitaxel/cisplatin) and computed tomography (CT)-guided iodine-125 brachytherapy (group A), 50 patients who received chemotherapy consisting of paclitaxel and cisplatin only (group B) were matched-up with the patients in group A. The local response rate was evaluated by CT. Progression-free survival (PFS) and overall survival (OS) data were obtained through clinical follow-up. Results: The patients were followed-up for 3–46 months. With a median follow-up time of 20 months, the OS and PFS were 20 months (95% CI: 19.09–20.90 months) vs 15 months (95% CI: 14.48–15.51 months) (P<0.05) and 13 months (95% CI: 11.96–14.04 months) vs 8 months (95% CI: 7.63–8.37 months) (P<0.05) in group A and group B, respectively. The symptoms of patients in group A were significantly relieved when compared with group B. Severe complications were not observed in either of the groups. Conclusion: The combination of iodine-125 seed brachytherapy and chemotherapy is an effective and safe therapy and is superior to chemotherapy alone for advanced NSCLC in the elderly.